Author of NY Times Bestseller DEEP COVER and national bestseller THE BIG WHITE LIE, used by Police and universities as training texts. Expert testimony accepted on more than 300 occasions in 17 states, Puerto Rico and foreign nations. 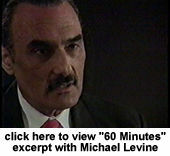 Called "America's top undercover cop" by 60 Minutes. 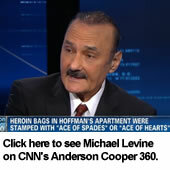 Among the most awarded supervisory officers in the history of the DEA. Author of FIGHT BACK, a manual for communities with drug problems - recommended reading by the Clinton Administration's Drug Policy Office and the Swedish Carnegie Institute. ·Title III Investigations (Wiretaps, bugs and other electronic intercepts). ·Controlled Delivery Operations & Smuggling. ·Police procedures and Investigative Reporting. Federal Judge Opinion as relates to DEA’s duty to protect its undercover informants, sets standards. 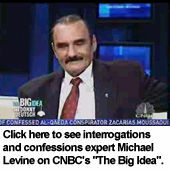 Michael Levine testified as an expert on Informant Handling procedures in two depositions and a federal trial. Informant “Princess” awarded $1.1 million. The judge’s actual decision (click here – PDF) contains important information for attorneys involved in informant handling issues. With over 40 years of intensive hands-on, award-winning experience on the streets and in the courtrooms, Michael Levine has acquired the vast insiders knowledge and razor sharp eye for details that are vital to expert testimony. The details that underlie and support his resume have stood up to the rigorous cross-examination of some of the best prosecutors and attorneys in the nation. 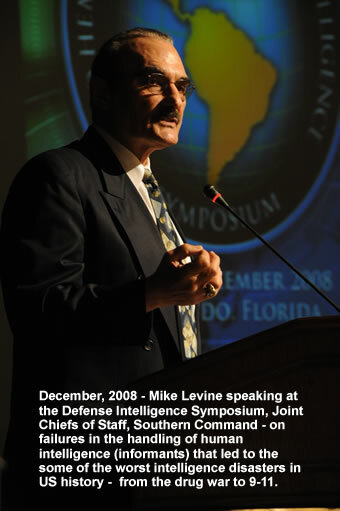 One of the most decorated supervisory agents in the history of the Drug Enforcement Administration, Mr. Levine has also served with great distinction with the U.S. Customs Service, BATF, IRS (Criminal Investigations Division) and the FBI/DEA Task Force. Trained and licensed as a police instructor by DEA, his career in police training, now numbering more than 30 years, continues to this day. Mr. Levine’s expert testimony (as regards all areas of expertise listed) has been accepted on more then 300 occasions in federal and state courts (both criminal and civil) in 17 states as well as Puerto Rico. He is a widely published, highly skilled professional writer, well known for the effectiveness of his reports and affidavits. His training and experience as a supervisory officer, inspector of operations and police instructor, combined with his insider’s anatomical knowledge of law enforcement operations, make him an invaluable asset in a number of important services. As a trial consultant and expert witness commencing with his DOJ retirement in 1990, Mr. Levine has reviewed and commented upon in excess of 300 full case files, relating to both civil and criminal matters, and involving a wide array of areas of expertise. This involves exhaustive and lengthy reviews of the investigative and law enforcement practices of many local and federal agencies, including but not limited to FBI, DEA, Customs, Homeland Security, BATF, ICE and more than 30 local, state and city police agencies throughout the U.S. This ongoing experience keeps Mr. Levine current and up-to-date on policies, procedures and standards of U.S law enforcement. A licensed Private Investigator, Mr. Levine is also active as a law enforcement instructor, journalist and investigative researcher. He maintains an extensive and continually updated database of information that relates to each area of his expertise. An important part of this database involves direct contact with more than 200 court-qualified law enforcement experts worldwide…colleagues with whom he consults on a case-by-case basis. 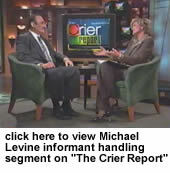 Michael Levine has appeared as a guest/expert on dozens of nationally televised shows, including 60 Minutes, Good Morning America, NBC & CBS Morning Shows, MacNeil-Lehrer News Hour, 20/20 and many others. He has also been retained as a technical consultant for multiple television series, and has appeared as an expert on various law enforcement related topics on numerous local television shows around the country. He has made guest appearances on hundreds of local and national radio shows around the country.